Welcome to the site of the Global Urban Soil Ecological Education Network (GLUSEEN). Use the menu items above to explore our resources. Urban soils provide many of the same ecosystem services as “natural” or agricultural soils e.g. decomposition and nutrient cycling, water purification and regulation, medium for plant growth, and habitat for an enormous diversity of organisms. Soil biota and substrate quality, along with abiotic factors, such as climate and parent material, greatly influences decomposition rates. In the highly fragmented urban landscape land history, cover and management will strongly influence, and, in some cases may override these drivers. Global Urban Soil Ecological Education Network (GLUSEEN) is an open source ecological network . 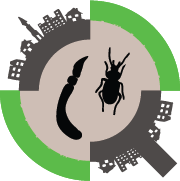 It is intended to be a worldwide multi-city comparison investigating the effects of urban environments on decomposition and soil community structure. What is the relative importance of native vs. anthropogenic factors on soil characteristics? How do assembly rules of soil communities differ in urban habitats, and how does this translate to ecological functions?? Do urban soil ecosystem attributes “converge” and soil communities “homogenize” at global and regional scales? Can observations of ecological structure and function of urban soils by citizen scientists advance our understanding of soil ecology? GLUSEEN develops experimental protocols that are simple to adopt across many habitat types and soil conditions in urban areas across the world. Urban soils can serve as in situ laboratories for citizen scientists to learn about ecological systems and the importance of biodiversity.